So I’ve been running a fair bit, training for this thing. I’ve run a bit on and off over the last few years, and the hardest bit is the first few weeks. My body wonders what it is I’m doing. It’s not that it’s tiring, but, rather, my legs aren’t used to the movement. Fitness isn’t really an issue. I reckon I’ve ridden near 50,000 miles over the last ten years (including several years of “serious” riding), so I have a pretty decent base. My fear for the GTR Ultra was that I’d do too much too soon, simply because my fitness level wouldn’t serve as a limiter for doing something stupid. I had been kinda-sorta building my mileage–doing a few miles a couple of days during the week, then doing a longer run (up to an hour or so) on the weekends. After a few weeks, I felt I could try running the “short way” home from work (roughly seven miles). This felt pretty reasonable, and the following week, I ran the “long way” home (roughly nine miles) without much trouble. (Lest anyone think I am some sort of running freak, these runs are not at all “fast” and over those distances at this point, I’m content to run 9-10 minute miles). I followed this up with a longer run on the weekend, which was done primarily on the few trails that loop through the woods in Highland Park. The longest length of trail, which skims the hillside overlooking Butler Street and Washington Boulevard, was designed primarily as singletrack for mountain biking. It’s the classic bench cut trail, following the contours of the land, never flat, always going up and down. There are a few sustained climbs, but those are branches from the main trail, bringing you up to Lake Shore Drive. The full loop of this trail (which is really not a loop, but a lollipop) is roughly a mile and half. So….I ran three laps on the lollipop, climbed up to Lake Shore Drive, followed short bit of singletrack to the reservoir, did a loop there, then finished with another loop and half of the the lower singletrack. Door to door, it was a little under 9 miles. I felt good on the run, and made a point to open it up a bit on the rolling bits of the trail, as I typically descend like a snail. This felt good, too, most of the time, but as I finished, I noticed my left knee was a bit sore. The soreness continued through the day, and it was a bit painful to walk down the stairs. I wrote this off to just a bit of soreness after a hard run, and I followed up with a short run two days later. This was a disaster, and my knee was sore almost immediately, and the run promptly turned into a shuffle as I tried to maintain some semblance of form. I did a very short run the following day (obstinate as I am), and this was okay, but short, so there wasn’t much time for my knee to get sore. I did 10k run the following weekend, and that was a bit of train wreck. There was a fair bit of snow on the ground, and I couldn’t resist hitting a trail or two in Highland Park. Ironically, I felt great on the trails, likely because they went up, and when I ran down Highland from the reservoir, my knee was quite sore, and the grandpa shuffle returned, followed by a bit of walking as I approached home. I wanted to throw my running shoes into Heths Run and be done with this running thing, but I knew that really wasn’t an option and, anyway, despite the pain, I had been enjoying it. I shuffled home, acted like a two year for a bit, then got over it and wished I could be running. Jen thought it was likely some IT band trouble, since my fitness heavily outweighed my leg strength (this is true, and getting up to nine miles within a month of real running could be seen as a Bad Idea). She suggested I talk to someone about it, so I emailed our running friends, and they concurred that, yes, it was probably IT band related. “Strengthen the legs, and keep running as long as you can do it without limping.” Okay, then. The Theraband is my new best friend. This was a rough week for my psyche, fragile as it is. I’m staring down the barrel of this 30k race, and now I can’t run hard. Or very long. I did two more short runs, including a few sprints, and those felt alright. Not great, but I mostly managed to avoid the grandpa shuffle. I’m sore today after this morning’s run, but it’s time to simply deal with it if the pain isn’t immobilizing me. I’ll likely lay off the running for a few days, as we leave for Florida this weekend, and Jen and I have a few runs planned. It would really, really, really be great to do some reasonable distances. Whoops. Guess the whole writing thing got away from me a bit. I can justify my silence here by pointing out we’ve been involved in this new church thing, and I’ve been writing about those experiences here (should you feel inclined to read about such things). The Fall passed mostly without incident, and with only a small amount of rock climbing. We managed to get to Coopers Rock a few times, but it seemed when we had the time, the weather didn’t cooperate, and when the weather cooperated, our schedules didn’t. Admittedly, I was a bit listless with climbing this fall–I didn’t really train consistently, and I didn’t really have any specific goals, especially at Coopers. That isn’t to say I didn’t have fun (I did! ), but I didn’t have the motivation to regularly train. Apparently the lack of real climbing goals has done something to my brain, and I decided to join Jen in running the Glacier Ridge Ultra 30k in April (for you Americans, that means a little over 18 miles). This is likely triple the distance of my longest run (including my halcyon days as a high school cross country runner), so I reckon I have a goal and some motivation for the next few months. My goal is rather simple: finish the race without permanent injury. Running has been generally enjoyable over the last few weeks, and it’s good to have a goal dangling out there. I’ve shelved climbing, at least ’til the system board is built in the basement, and that’s okay, too, given that honest-to-goodness winter has settled here. It’s neat to be learning a new thing. You might say “how does one learn running?” but like most things, there are little details that might not be obvious the outsider (such as, what sort of things can my stomach tolerate during a 30k run or how do I deal with the inevitable mental valley during the race when I’d much rather be at home on the couch instead of halfway through a race on some obscure bit of singletrack trail on the distance shores of Lake Arthur?). I enjoy these sorts of learning experiences, and I suspect this race (and the lead-up to it), will provide plenty of opportunities to learn both about running and myself. Don’t worry, the space won’t become a training (today I ran twelve miles and only felt like dying twice! ), but I may document some of the more interesting moments, particularly when we go off for long runs in the woods. We stole away to Coopers on a Monday to enjoy the Indian Summer. Yes, there’s a bike race going on in France. Many pundits thought this could be the most exciting race in some time, with Alberto Contador serving a doping ban, and Andy Schleck nursing broken bones. Cadel Evans looked primed to go for a second consecutive win, while Bradley Wiggins, Vincenzo Nibali, and a host of others legitimately could be called contenders for the general classification. The course was, on paper, perfect for riders like Evans, Wiggins, and Denis Menchov–steady climbs and lots of miles against the clock (individual time trials). Exciting! Every contender lost a handful of seconds to Wiggins in the prologue. “Not to worry,” they said. “We have plenty of miles to Paris.” Fabian Cancellera wore the yellow jersey for a week, some sprinters won, and Peter Sagan announced to the world he is actually a pretty good bike racer. Then came the first time trial. Wiggins blew everyone out of the water, aside from his teammate Chris Froome (who pipped Wiggins at the Spanish tour last year for second place), who finished roughly thirty seconds off the pace. Evans lost over a minute and half. “Not to worry,” he said. “We have plenty of miles to Paris.” The race headed toward the Alps, and excitement was sure to ensue. Wiggins’ Team Sky absolutely controlled the race, much like the Lance Armstrong-led Postal and Disco teams. No one could get away, and often, Wiggins had three or four riders with him on every climb. The only moment of excitement was when Froome “accidentally” dropped Wiggins for a few moments. No doubt, the Sky director was yelling in Froome’s ear, and he sat up ’til Wiggins made contact again. Again, there was some hope that Pyrennes would offer a chance for Evans or Nibali, at least, to make up some ground, but even on today’s queen stage, Sky absolutely controlled the race (though Evans did blow up, and is now seventh on the GC). It was also pretty clear that once Evans cracked, Nibali was riding for the podium and only put in one concerted attack on Fr-iggns (Froome/Wiggins). Yes, there’s another mountain stage tomorrow, and Nibali may attempt to overtake Froome on the GC, but given that Van Den Broeck is nearly two minutes behind in fourth, why should Nibali risk anything? So, yeah, aside from some heroics from the stage hunters ( chapeau, Thomas Voeckler), this race has been pretty boring. I optimistically think someone like Andy Schleck or Contador would very much shake things up (see Contador’s antics last year, when he wasn’t a factor for the GC after crushing the hardest Italian tour EVER). Sky is obviously a strong team (hear those whispers about doping? ), and Froome (perhaps rightly) complained in the press about being Wiggins domestique when it has been clear he could win the whole race. Richie Porte and Mick Rogers also had impressive races as mountain goats, and I can’t help but think on a reasonably strong team, they could at least factor in to the podium discussion. But…if this is what stage racing is to become, then you can have it. It’s just not interesting to me. Finally, what of poor Frank Schleck, he of the positive drug test for a controlled diuretic? He is claiming he was poisoned (taking a page from Contador’s defense), and the best conspiracy theory out there at the moment is that Radio Shack-Nissan (his own team) slipped him the mickey. This sounds far-fetched, but consider: Johan Bruyneel was indicated by the USADA for running a doping operation during the US Postal/Discovery Channel days. His best riders (Frandy Schleck) essentially quit on the team (though, in Andy’s defense, he did break his hip). RSN couldn’t pay some of their riders, and Frank Schleck was complaining loudly to the press about that. Would Bruyneel stoop that low? Eh, maybe? In any case, this only means the Schleck soap opera will contain for the rest of the season, as Frank fights the doping charge, and he and Andy try to create yet another team will clearly be the key for Andy winning the Tour de France. Life On Hold Preview – The Prow from Outcrop Films on Vimeo. Yes, a new scooter. Where’s the old, you ask? Funny story, that. So, the Honda was having an electrical issue, and after much wembling, Jen convinced me to take around the corner to our mechanic. He said he didn’t know much about them, but would be happy to poke around when he had the time. So, it sat there for a month or so. He found the source of the issue, and after many phone calls, found the part. There was much rejoicing. A few weeks ago, about a day after he told me the part was on its way, Jen emailed me during the day. “Something in the neighborhood is on fire, maybe the old bar.” I thought I should poke around after work, but alas, I forgot. The next day, she calls me. “Mike was just here. Remember that fire? It was in his garage. Remember our scooter? It’s just a pile of melted plastic.” I wasn’t too upset, given that between our insurance and his, I’d get some cash for it (though likely not much). I set about looking on Craigslist for a new ride. Two options quickly presented themselves: a 2008 Vespa LX50 with only a few hundred miles, and an Aprilia SR50 Factory with lots of miles, but owned by a mechanic. I spoke with an acquaintance who knows scooters, and he said that either would be a great buy. The Aprilia owner wasn’t quite sure he was ready to sell, so I went off to look at the Vespa. The owner was in McKeesport, so I climbed in the van on a Sunday and headed out to look at it. The owner was selling because she moved there, and it was too hilly to use as regular transportation. As I climbed out of the river valley, I thought, yeah, this is pretty hilly terrain for a little scoot. As I wound past housing projects and run down houses, I began to wonder if this wasn’t an elaborate plan to kill some gullible city slicker. I parked the van on a steep, cobbled hill, and found the house. I can say that the owner didn’t kill me, and the Vespa was secure in a garage, in absolutely pristine shape aside from needing a new battery. I took it for a spin, confirmed that it did work, besides an occasional stall at idle, and decided it seemed like a good deal, and I should make plans to buy it. A day later, the Aprilia owner calls and says “yeah, I’ll sell.” So I make plans to look at it while being vague with the Vespa owner about buying her scooter. A day later, I call the Aprilia owner again to set up a time, and he says “yeah, man, I was taking out to the store, and boy it was going like the stink, ’til it stopped about 100 feet. I think the injectors are bad, but I’m not sure.” In the interim, I had convinced myself there was something foul with the Vespa, since how could the owner sell it for less than folks were selling Mets with more mileage? And now, without the trusted source of the Aprilia (my friend knew this guy personally), what was I to do? As all this was happening, things were moving along with my insurance. An adjuster called to tell me he talked to the mechanic, and yeah, the scooter was a total loss (it was clear that he had many more important things to do, and he was looking for the simplest way to clear this scooter off his plate). As he began to tell me what they’d offer, he was quick to temper my expectations–“things depreciate, you know”–and I was already prepared for a few hundred dollars. Then he told me the number, and I had to hide my surprise–I was getting more than we initially paid for the scooter. “Yes, I understand…I think we can live with that,” I said. This suddenly gave the scooter search a different dimension. Do we look into getting a new scooter? We could afford it now, with just a little bit more cash from our coffers. I argued both sides (the Vespa, or a new Piaggio or Buddy) for a few days, and finally, the cheap skate financially responsible part of me won, and we decided on the Vespa. I was still a bit nervous about the thing not running after ten minutes, so I convinced the owner to drive it to the AAA in White Oak where we’d transfer the title. I figured if it didn’t make there without stalling 50 times (or didn’t make it at all), I could cancel the transaction and we’d drive a bit further up the road to Mosites and buy a Piaggio. The Vespa did, indeed, make it to the AAA, and it made back to Pittsburgh (riding along Route 30 on a 50cc scooter is interesting). The battery was indeed dead, and after a bit of searching, I managed to find a replacement (which precipitated a ride to the North Hills on the scooter). It still sometimes stalls on idle, but cleaning the carburetor and mucking with the mixture should take care of that. Yes, it’s baby blue. It currently has stars on it. So what? The guy who rides a motorcycle that is possibly bigger than our van. 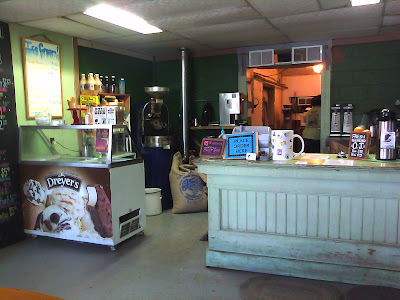 This is the Green River Coffee Company, in Green River, Utah. We needed lunch, but didn’t want to do the typical Subway/gas station food. As we cruised Main Street in Green River, this place caught my eye, and we decided to take a chance on it (I figured the worst case scenario was a single bad cup of coffee). We were pleasantly surprised: good coffee, a nice selection of breakfasts and sandwiches, and a neat stop on the way to Grand Junction. We are at a hotel in western Ohio. Yes, tantalizing close to home, but it’s late enough that pushing on would be silly. We meant to camp on the way back, but rain in Kansas, and thunderstorms in Ohio, have kept us in hotels. Hey, we roughed it for two weeks, so we can afford a couple of nights of comfort. The drive home has seemed long, really long, mostly due to the fact that we started in Grand Junction, CO, rather than our usual jumping off point, Denver. The extra five hours will keep us away from home for an additional night, though we should arrive early enough tomorrow that it won’t be too big of a deal (plus, the cat would keep us up all night anyway). * Reliance folding water jugs are terrible. Two of ours had holes out of the box, and another was bitten by some woodland creature. * Our sun shower worked really well–until another woodland creature chewed big holes in it. A strong wind overnight knocked it out of the tree (at least that’s what I’m telling myself), and it was riddled with holes the following morning. * According to the guidebook, there are areas at Maple Canyon besides the Right Fork. We only sampled the Campground crags part of two days, and spend half a day wandering about the middle bit of the canyon. The crags at Right Fork were just too good (and convenient to our campsite). * I am glad to be out of the dust at Maple, and the rain overnight gave the van a much-needed (free) wash.
* I miss the smell of the sub-alpine pines baking the afternoon sun. * It was troubling, at least a little bit, seeing bolt sleeves protruding from broken rock whilst ‘dogging up Sprout in the Pipedream cave. I told myself those were placed on lead for bolting the route, and removed. Yeah, that’s the ticket. They most certainly didn’t break (or, worse, the rock around them didn’t break) during a real lead fall. * Kansas is still pretty flat. * Popcorn (5.12b) was probably my favorite route of the trip, and only partially because I onsighted it. Sooooo long and sooooo much fun. * I am not looking forward to hitting the fingerboard again. After a month off of it, I expect to be very weak. Very, very weak. I’m currently at Rose’s Laundry, your typical college-town laundromat nestled at the foot of the university campus. This is our second rest day in Salt Lake City, and it is decidedly nicer than the first. Last week, we came to town with a cold front that ended up dumping snow in the mountains and kept the day time temperatures in the 50s. The kids and I spent laundry day in the van, and we skittered from one errand to another, woefully under-dressed. Today is different. The sun is out, and it’s actually warm. The kids and Jen are at Liberty Park, and I’m enjoying the breeze coming in the window. We grabbed coffee and pastries at Tulle’s, and will seek out some Mexican for lunch before returning to the canyon for three more days of climbing. SLC is an interesting town. The area around Liberty Park is quite nice–quaint neighborhoods with little shopping districts full of bakeries and coffeehouses and cafes. Cute houses sit on tree-lined streets. I must give the Mormons credit–they have good architectural sense when it comes to their homes–even in little towns like Ephraim and Fountain Green, the houses are cozy and solid. Of course, there are developments in the suburbs of SLC, but at least where we are now, the homes are unique. At the moment, I’m seconding-guessing my decision to pass on a job at Black Diamond–I can’t help but wonder what it might be like living here, nestled in the shadow of the Wasatch range, a mere 90 minute drive from Maple Canyon (and less than 20 from the granite boulders of Little Cottonwood Canyon). It would be nice, I’m sure, but what about in five years? Old age and parenthood forces you to take the long view. As for Maple, what to do in the closing days? I could polish off the right side of Minimum Wall–two 5.12s plus the four-star classic 5.11 Zoaster Toaster remain. Jen may want to trudge back up to the Pipedream cave to clean up Deliverance. I could put in a concerted onsight effort into Orgasmo (5.12c), which several others did last week. I’m glad I’ve focuses on quickly dispatching 5.12s rather than flailing on 5.13 projects–I’ve been able to sample many routes, something projecting doesn’t necessarily afford. I will say, however, that I prefer bouldering road trips–while Maple has been fun, it’s easier to simply throw your pads down under a project and not deal with ropes and taking long turns. I’m not complaining, though–the climbing has been wonderful, and we’ve all had a good time (both Seb and Oren have climbed a bunch, and Seb has even fought his way up a 5.10).